For the last 8 months, I have been using a shampoo and conditioner and hair oil from a new haircare brand called O’Right. I have tried other products in between but as these are such huge bottles, I have always gone back to trying out these products in between testing other things. 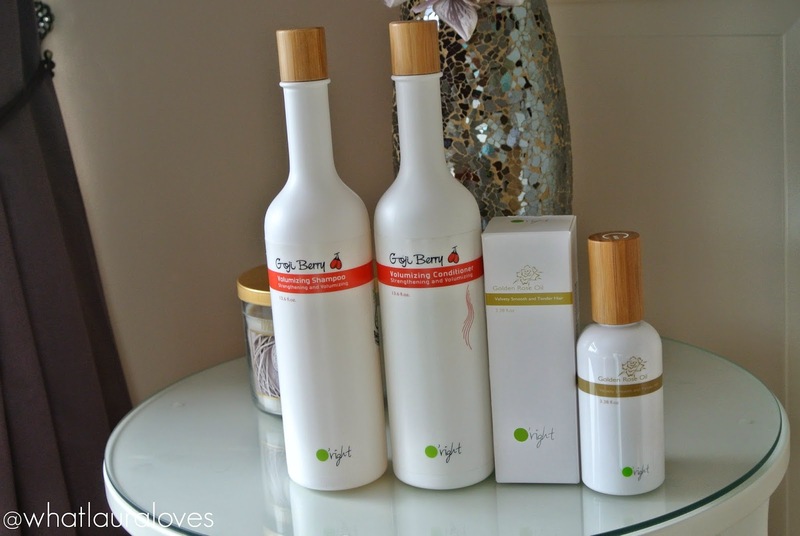 The O’Right brand prides itself on being one of the worlds most environmentally friendly hair care brands. Some of their bottles, when empty, can even be buried in the ground and it will decompose and perhaps grow a tree which is a really cool and environmentally friendly concept. The packaging of the hair oil that I received also had seeds on to plant and grow! O’Right hair products contain certified organic ingredients, natural plant extracts, essentials oils and botanicals, powerful antioxidants and amino acids and nourishing vitamins and nutrients. They’re great quality without compromising on ethics! 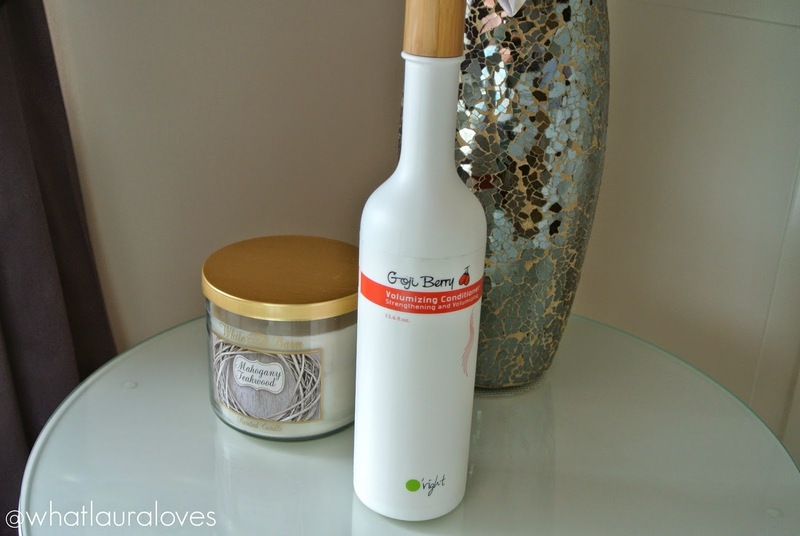 The first product that I have been using is the Goji Berry Volumizing Shampoo which contains 96% natural ingredients. This shampoo is designed for fine and limp hair, which I certainly have, and it aims to cleanse, strengthen and add volume to the hair with the extreme elastic complex that is within the formula. It has certified organic foaming agents that help to clean the scalp gentle which regulating sebaceous secretions which is ideal for those with oily roots like I have. The strong influence of Goji Berry in the formula helps to reinforce the hair roots and hair structure to strengthen it. 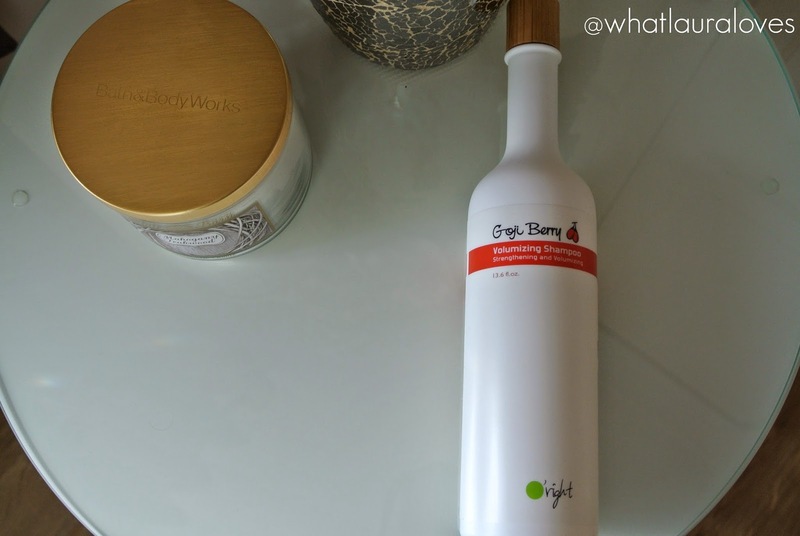 The Goji Berries in this shampoo and conditioner are antioxidant rich and certified organic. I absolutely LOVE this shampoo. It cleans my scalp and hair brilliantly well, especially considering the amount of dry shampoo that I use in my hair! It is easy to use, lathers up really well and is easy to wash out. The shampoo has a light fruity smell that does linger on the hair for a little while after using it. 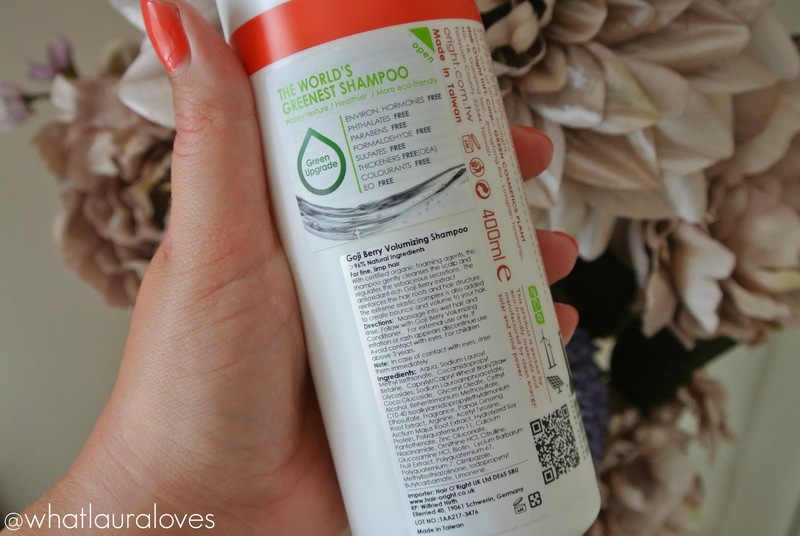 Regardless of whether I blow dry my hair or leave it to dry naturally, this shampoo adds lots of volume to my hair without drying it out or making it feel crispy like many volumising shampoos do. The shampoo comes in two different sized bottles, a 250ml bottle and a 400ml bottle like the one I have here. 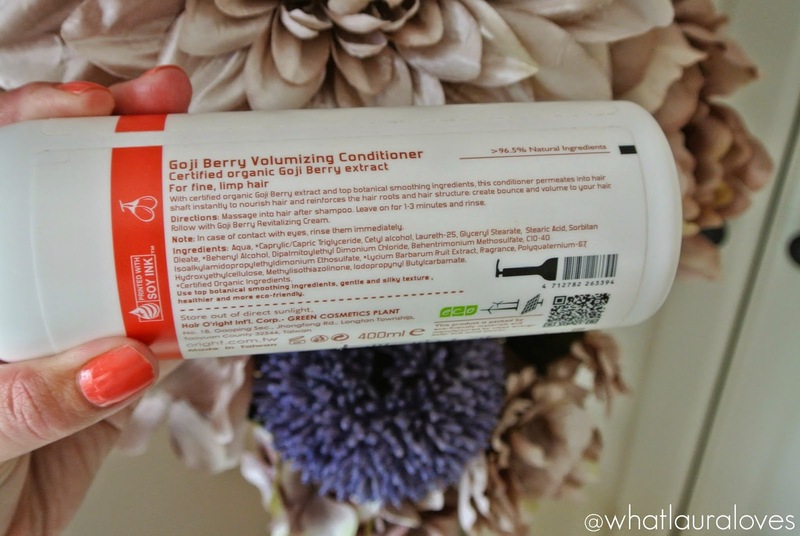 The Goji Berry Volumizing Conditioner is also designed for fine and limp hair. It aims to give it some bounce and volume which it certainly does. After I have used this my hair feels like it has lots of body and volume, regardless of whether I have left it to dry naturally or blow dried it. After using the conditioner, my hair feels touchably soft but not too fine and fly away. The conditioner doesn’t weigh my hair down and it doesn’t make it feel greasy, even when using it right up to the roots of my hair. Both the shampoo and conditioner have a beautifully light fruit scent. I don’t find that it lingers on the hair for too long after use but it is pleasant while it lasts! What does last though, is the volume that they create as it doesn’t drop straight away after drying and my hair feels as though it is carrying more volume right through until the next day. The Goji Berry conditioner comes in a 400ml bottle like the one that I have and a humongous 1000ml bottle. A little goes a long way with this duo so you will have the bottles for ages. I would absolutely recommend them to anyone who is looking to add a bit of volume and bounce to their hair. Although they aren’t cheaply priced, their are well worth it, especially for the amount of product that you get. The disappointing product of the bunch for me had to be the O’Right Golden Rose Oil which is designed for colour treated and damaged hair. It aims to repair the hair cuticles and replenish hair moisture using golden rose essential oil and water soluble silicone which are supposed to help repair cuticle scales to restore tightness and gloss in the hair. This hair oil features innovative micron technology which enables it to be absorbed easily without leaving the hair feeling oily which I do agree with. I have tried this on both wet and dry hair and have found it to be more effective on wet hair and there is a slight difference in the manageability of my hair after using it and in how sleek it is when it dries. However I didn’t notice much of a lasting difference at all when applied in dry hair. It would make my hair look a little more glossy for a couple of hours and then it would look normal, as though I hadn’t used it. On the plus side, it didn’t make my hair feel greasy or more oily which is always a bonus! In all honesty, I wouldn’t repurchase this hair oil as I don’t think that it works effectively enough and at £27 for 100ml, I think that it is over priced for what it does to my hair. I guess I have been too spoilt with my Macadamia Healing Oil Treatment which my hair literally drinks up. I would recommend this one over every other hair oil that I’ve ever tried. This is what my hair looks like after using the Goji Berry Volumizing Shampoo and Conditioner and the Golden Rose Oil. Lots of natural looking volume! 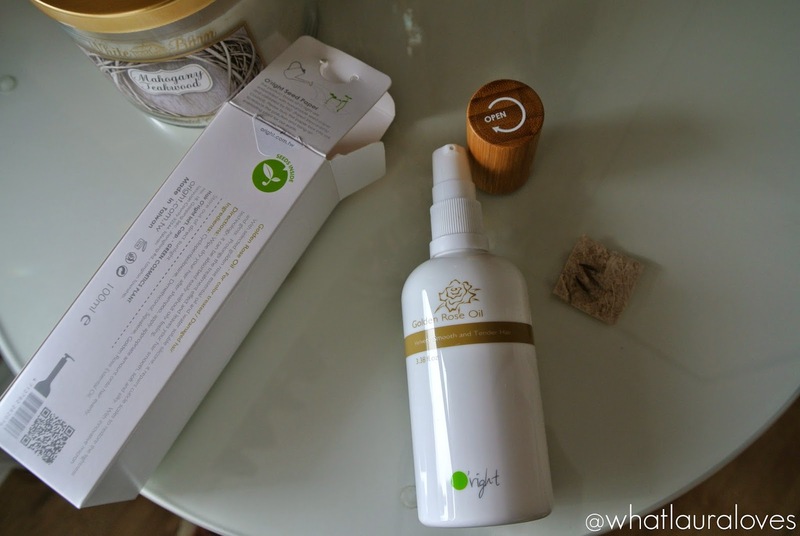 You can check out the range of O’Right products on their website here. What are your favourite volumising products and hair oils?